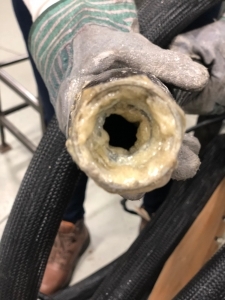 Don’t throw away your electrically-heated hoses after they become clogged with PUR adhesive! Send them to IMMCO to be cleaned for a fraction of the cost of a replacement hose. PUR Adhesive is great for a wide range of applications, but the material has a drawback. With each cycle, a thin layer of PUR cures on the inside of your hose. Over time, the layers build until the capacity of the hose is greatly diminished and it becomes unusable. The hose heats, but it is impossible to achieve your desired pump rate. At this point, most manufacturers just buy a replacement hose and throw the old one away. A replacement hose might cost $1,000, $2,000, $5,000, or even more! What if you could get your hose cleaned for $1,000 or less? Well, now you can. 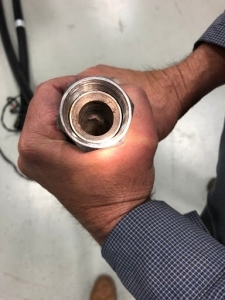 At IMMCO, we will examine your hose for defects and test it to be sure it heats properly. If the only problem is a buildup of PUR adhesive, we will thoroughly clean the hose so it once again performs like it did when it was new. Turnaround time for hose cleaning service is typically 2 to 4 weeks. Hose cleaning service cost is a fraction of what you would pay for a replacement and it’s just as effective of a solution. Check out our affordable hose cleaning cost estimates. Instead of investing thousands in new replacement hoses, turn to IMMCO for prompt and professional hose cleaning service. Not only will our services get you back to achieving desired pump rates, but our turnaround time and pricing can’t be beaten.